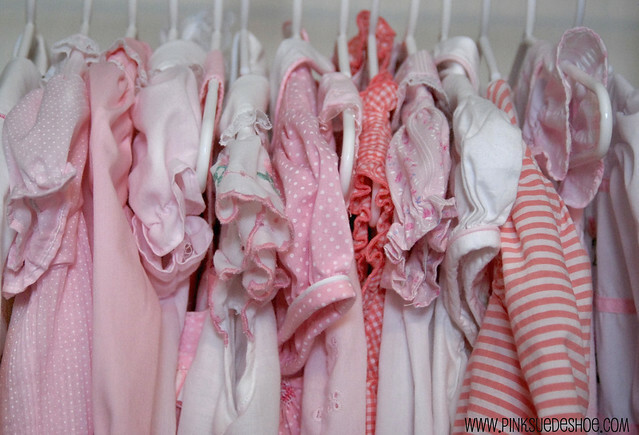 My little collection of pink dresses are my favorites. I mean, how can you go wrong with little pink ruffles and polka dots and puffed sleeves? You can’t. That’s right, you can’t go wrong. I can’t pick a favorite, I like them all. But I find myself particularly drawn to smocked dresses. 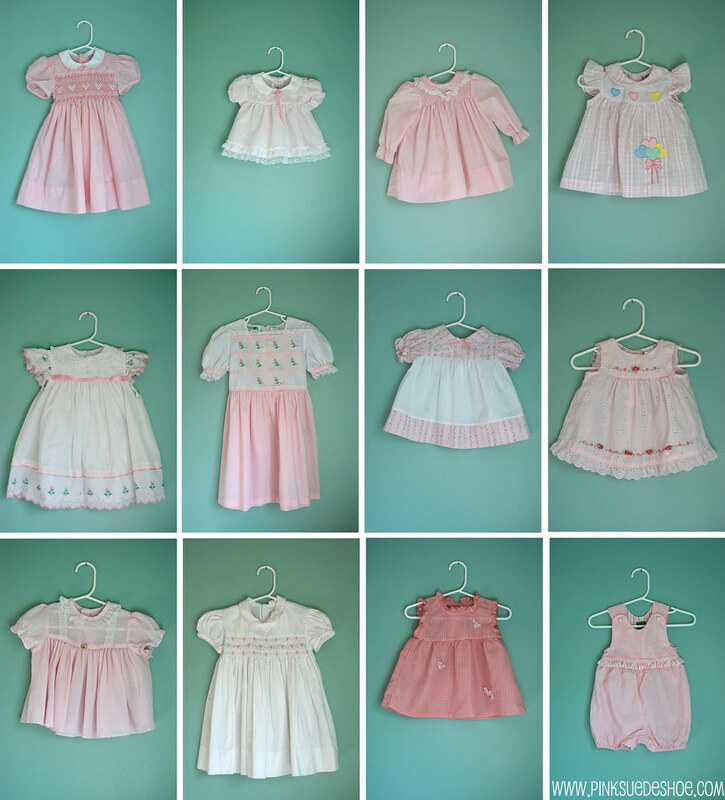 I think more than half of my dress collection are smocked. I think they are a classic that never goes out of style for little girls. I found these two dresses at different stores a few months apart. But they both have the same little flowers embroidered on them. 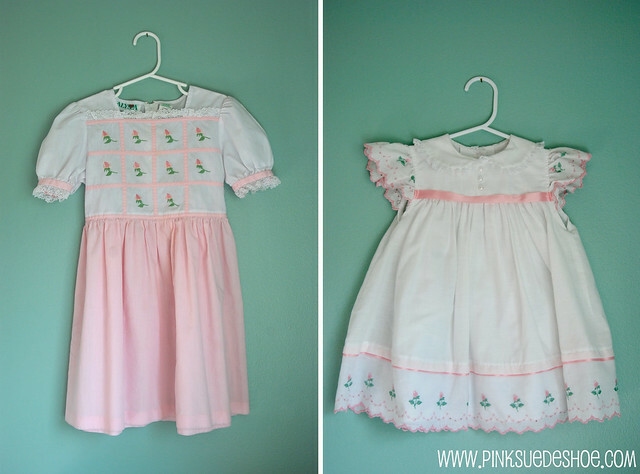 And the dress on the left is in a larger size, it will probably fit Creamie when she is four or five. I’m not sure why, but vintage dresses for older girls are a lot harder to find. Everytime I visit the thrifts I can find a dress for a smaller than my 2.5 year old. But it’s only once in a great while I find one a little bit bigger. ← National Pink Day 2011 Begins! 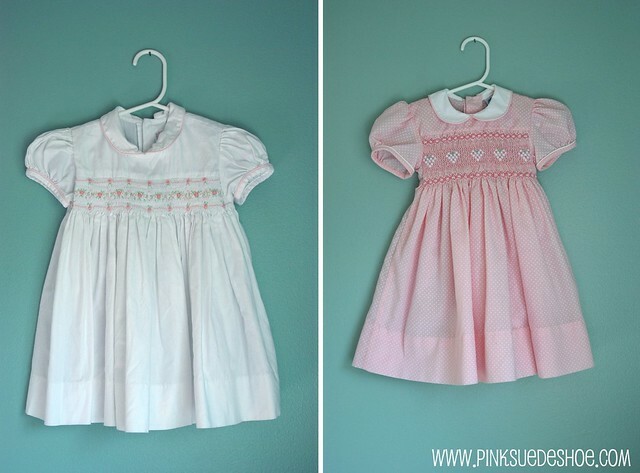 I love smocked dresses, too– especially bishop style. I love the dress collection, and I love that your family is so good at hanging on to that kind of stuff. I have saved all Ethan’s smocked things, but practically everything else has been tossed. Oh, and the other day, I found a size 10 girls smocked dress for $2 at a thrift store. I bought it even though it wasn’t pink, and even though I don’t have a little girl. 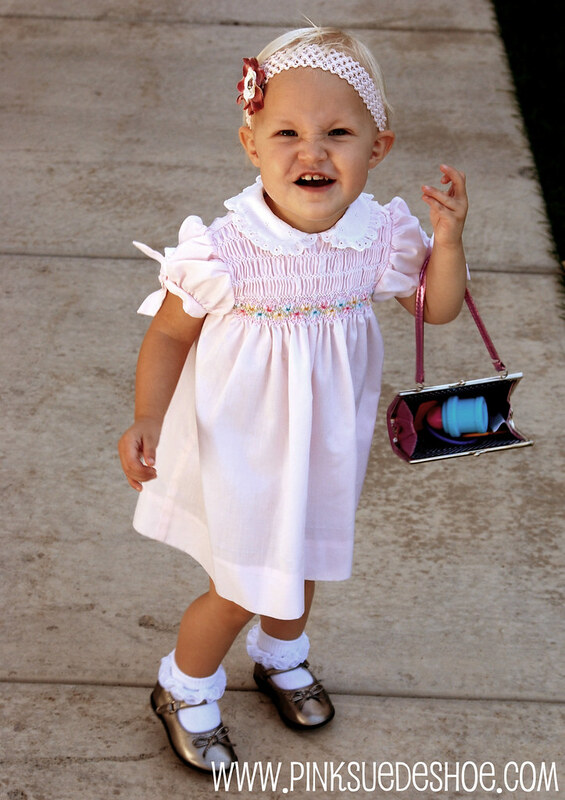 When my daughter was small I took every opportunity to dress her in pretty clothes, as I knew that that phase would not last long. I have looked through your site and found it fascinating. Pink is my favorite color too, though not one that I can wear very well in clothes. Loved the flowers! Your dress collection was just darling. I especially liked the 3rd dress from the left in the top row. Question: How do you clean up things that you get from thrift stores? I’ve always wanted to visit one but am kinda afraid to cos I’m a little OCD when it comes to cleanliness.